There is a lot of confusion about ‘excess protein’ and whether you can have too much protein on keto. Insulin and protein are used to build and repair your muscles, organs and the other important parts of your body. This is an important and beneficial use of protein and insulin. Foods that contain the harder to find nutrients (e.g. potassium, magnesium, choline, vitamin D) typically contain plenty of protein. Actively avoiding protein and can lead to a less nutritious diet. Unless you require therapeutic ketosis for the treatment of cancer, epilepsy, Alzheimers, Parkinson or dementia, you should be chasing vitality, health and nutrition along with stable blood sugar levels rather than some arbitrary ketone level. There are a range of different ways to quantify protein intake. Thinking in terms of percentages can be more confusing than helpful. It’s hard to over-consume protein because it is highly satiating. However, if you avoid protein your body may drive you to consume more calories until you get the protein it needs. If you follow your appetite and focus on foods that contain the vitamins and minerals you need you will probably get enough protein. I recently had the opportunity to pose some questions about protein intake to the Godfather of Keto, Dr Stephen Phinney in a recent Facebook live Q&A. Dr Phinney’s response to my question is shown below, including his recommended protein intake levels of 1.2 to 1.75 g per kg reference body weight of protein. While I largely agree with Dr Phinney’s response, I think it’s worth elaborating on some of the issues that are causing so much confusion at the moment. Will too much protein kick me out of ketosis? If you’ve read previous posts on Optimising Nutrition you’ve probably seen my analysis of the food insulin index data that shows that our carbohydrate intake alone doesn’t explain our insulin response to food. The food insulin index data shows that our insulin response to food is more accurately predicted when we consider the fibre and protein content of our food, not just the carbohydrate. However, I fear that many people have used the insulin load concept as a reason to avoid protein. I now understand that this is far from optimal within the broader context of good nutrition for health, weight loss and vitality. The 100 most ketogenic diet food. While trading your calories from butter for steak will increase your requirement for insulin, the food insulin index data suggests that as a general rule, getting more of your energy from protein will reduce your insulin requirements as it forces out processed carbohydrates as shown in the chart below. Getting more energy from protein tends to decrease our glucose response as it forces out nutrient-poor refined high carb foods. Your body can convert protein to glucose (i.e. gluconeogenesis) if it really needs to but it’s a lot of work, so it would much rather get energy from carbs or fat. Protein is also very satiating. Once we have enough protein, our body tends to crave more fatty and carby foods for energy. While it is both financially and metabolically expensive, protein is the most important component of your diet. Different people will need different amounts of protein depending on their life stage and activity levels. While you probably don’t need to be going out of your way to binge on more protein than you can comfortably consume, actively avoiding protein containing foods is a recipe for nutritional disaster. If you are exercising or lifting heavy then you will naturally crave more protein. If you actually need higher levels of blood ketones for therapeutic ketosis, it may be a good strategy to consciously restrict protein. However, I don’t’ think the vast majority of people chasing ketones are looking for therapeutic keto for the management of cancer, Alzheimer’s, epilepsy, dementia or Parkinson’s but rather fat loss or diabetes control. The numbers around protein can be confusing due to the units used. Dr Phinney uses ‘reference body weight’ (RW) (which he says is ‘the weight you were when you were in college’). The mainstream nutrition world talks in terms of total body weight (BW). Meanwhile, the sports nutrition community talk in terms of lean body mass (LBM). In order to understand what this means in practice, let’s look at an example of a woman who is currently 40% body fat but was 25% in college (i.e. her reference weight). For argument’s sake let’s say she was 70 kg in college but she is currently 87 kg or 193 lb. The images below will give you an idea of what these level of body fat levels look like. Based on Dr Phinney’s guidance, this person should be eating between 84 and 123 g of protein per day. On a practical note, there is nothing low about 2.3 g/kg LBM protein. While I do track my intake I find it hard to get above 2.2 g/kg LBM even when trying to maximise protein. At the same time, the lower limit is well above the official Recommended Daily Intake of 0.84 g/kg for men and 0.75 g/kg for women which are set to maintain nitrogen balance and prevent disease (i.e. not achieve optimal health and vitality). Talking about protein in terms of percentages of energy intake can be confusing as it depends on your activity levels or whether you are dieting. Theoretical energy intake requirements are based on your lean body mass and activity levels. The table below shows what Dr Phinney’s protein recommendation of 1.2 to 1.75 g/kg RW (or 1.6 to 2.3 g/kg LBM) look like for our hypothetical woman above in terms of percentage of energy intake for different energy intakes depending if she was trying to lose weight, maintain weight or was more active. Protein intake in terms of percentage energy intake can vary widely to the point that it’s practically useless. It’s generally much more useful to talk in terms of protein intake in grams per weight lean body mass rather than percentages. Since stumbling across the insulin index, one thing I have found consistently is that nutrient-dense foods are not low in protein. If you are focusing on the foods that contain the harder to find nutrients (e.g. magnesium, magnesium, choline, vitamin D etc) you will be getting plenty of protein. Conversely, the only way to really get the ultra-low protein intakes being recommended by many people without an energy deficit is to avoid most solid foods and prioritise macadamia nuts, butter and oils. It should not be a surprise that it will be hard to get a broad spectrum of essential nutrients with this sort of dietary approach. As shown in the chart below, nutrient density tends to increase up to about 50% of energy intake. If you’re eating more than 50% protein you’re likely relying on processed foods and supplements. The chart below shows the nutrient profile of the most nutritious foods in the USDA database. If you could stick to these foods you would easily be getting a lot of the essential nutrients without having to consume too much energy. The problem with these foods is that they can be very satiating which makes it hard to get enough energy in if you are active. However, if you are trying to lose weight these foods may help to ensure that you are getting the nutrients you need with less energy without being hungry. It’s interesting to see many people who have been experimenting with the Nutrient Optimiser have commented on how little food they can get away with while experiencing minimal levels of hunger. Nutrient dense foods tend to be hard to overeat and also provide you with the nutrients to prevent cravings and hence reduce appetite. For comparison, the chart below shows the nutrient profile of the ketogenic diet foods. That is, the foods that have the lowest percentage insulinogenic calories. These foods are 80% fat, 15% protein and 3% net carbs). Ironically, an individual consuming these foods will be meeting the minimum levels of protein but they will be missing out on a large number of other vitamins and minerals. I find that it’s often the people who are trying to actively avoid protein that find themselves at the bottom of the Nutrient Optimiser Leaderboard with a very poor nutrient profile. The chart below shows the nutrient profile that we get when we actively avoid protein. The only nturients that we get enough of in this scenarios is sodium and vitamin C! Unless you are chasing therapeutic ketosis for the treatment of cancer, epilepsy, Alzheimers or dementia I think your focus should be on building health and maximising nutrition rather than higher ketone values. If you are getting the micronutrients you need to thrive you will be getting plenty of protein and won’t need to worry too much about getting adequate protein intake. Conversely, if you are actively avoiding protein you will be unnecessarily sacrificing your other micronutrients (especially if you are replacing your calories from protein and carbs with refined fat). But will too much protein kick me out of ketosis? As I write this I have been experimenting with adequate protein with less fat and carbs and maximal nutrients on the Ketogains Bootcamp. A typical daily Cronometer summary is shown below. My protein is sitting at about 2.2g/kg LBM for me given that I’ve been spending a lot of time in the gym lifting heavy during this time. I’ve also been able to hit many of the nutrients targets while maintaining a significant calorie deficit. Leading up to this period my blood glucose levels were sitting in the mid 5s (approx 100 mg/dL). However, once I introduced the energy deficit my glucose levels plummet to the mid 4s (approx 80 mg/dL). And although I don’t worry much about ketones, they seem to be sitting at around 0.7 mmol/L, which I’m pretty happy with. I know if I keep my blood glucose around this level I will continue to lose weight and continue to improve my glucose control and HbA1c. I also get plenty of breath acetone from endogenous ketones as shown on my Ketonix below. Don’t forget the basal insulin! to control the release of glucose from our liver while the energy in our bloodstream is used up. People with type 1 diabetes demonstrate happens if we don’t have enough insulin. Not only would we not be able to store the energy we eat as fat and muscle, the brake comes off the liver and all the stored energy in our body comes flowing out in the form of excess glucose and ketones (i.e. diabetic ketoacidosis). The image below is the same child, “J.L.”, in the 1920s before and after receiving insulin therapy. In a healthy person, insulin suppresses the fuel flow from the liver to healthy levels. In someone on a standard western diet, basal insulin represents about 30% of the today daily dose. Basal insulin drops to about 50% for someone on a low carb or keto diet. But you can never drop your insulin requirements to zero. You always need this basal to stop the uncontrolled flow of fuel from your liver into your bloodstream. We focus so much on the effect of the food we eat but we forget that it’s also the excess fuel on your body and floating around in our bloodstream that also plays a massive role in the insulin demand on our pancreas. Whenever there are high levels of energy sitting in our bloodstream (from glucose, ketones or fat) the pancreas has to ramp up basal insulin production until the fuel in our bloodstream is used up. The more fat there is on our body the harder our pancreas has to work to hold back the pressure of excess fat on our body from being released into our bloodstream. So, you may believe that your mug of Bulletproof coffee or the fat bomb may not be raising your insulin levels because it does not contain glucose or protein. However, your pancreas is still working overtime to produce more insulin to hold the fat on your bum and until the energy coming in via your mouth is used up. You may be able to ramp up your energy expenditure for a while by shivering and fidgeting, more but after a time of overdriving energy you’ll likely end up fat and insulin resistant. If you really want to reduce your insulin levels you need to work on reducing the excess level of energy floating around in your bloodstream (from any source, including fat, carbs, protein or exogenous ketones) so your pancreas will decrease its production of insulin to allow body fat to be used. Focusing on obtaining the nutrients you need without too much energy seems like common sense to me. Someone targeting therapeutic ketosis to assist with the management of chronic conditions such as cancer, epilepsy, dementia or Alzheimer’s may benefit from higher levels of ketosis and less reliance on glucose. But I don’t think the vast majority of people who are Googling “keto” at the moment are looking for a therapeutic treatment. Understanding how to quantify the insulin load of our food enables us to accurately tailor or food choices to suit our goals. When it comes to insulin load we need to keep it low enough to get the results we need without compromising the nutritional value of the food we eat too much. The chart below shows that nutrient density peaks at around 40% insulinogenic calories. If you are insulin resistant it would be prudent to have less than 40% insulinogenic calories. Someone on a low carb diet might have less than 25% insulinogenic calories. Someone targeting therapeutic keto will likely need to have less than 15% insulinogenic calories to see therapeutic levels of ketones. Unless you really require therapeutic keto then I don’t think there is a need to worry too much about the impact of protein on your blood ketone levels. Actively avoiding protein tends to lead to compromising nutrient density unnecessarily which may lead to nutrient cravings or deficiencies in the long term. People who require therapeutic ketosis should also ensure that they are not driving the total energy in their system too high. To do this they can track their glucose as well as ketones. The glucose:ketone ratio (GKI) which was developed by Dr Thomas Seyfried to measure the degree of therapeutic ketosis. If you’re interested, your GKI can be calculated by dividing your glucose (in mmol/L) by your ketone values. For example, if your blood glucose is 108 mg/dL and your blood ketones are 0.5mmol/L, GKI = blood glucose / ketone = (108 mg/dL / 18) / 0.5 mmol/L = 6 mmol/L / 0.5mmol/L = 12. People who are chasing therapeutic ketosis typically do not need to worry about ingesting too much energy. Driving a hypercaloric state with refined fats is not a major concern for someone trying to keep weight on (e.g. cancer cachexia). However, ensuring that they are achieving lower glucose levels will ensure that they are not driving insulin resistance. For reference, the table below shows the relationship between HbA1c, average glucose, ketones and GKI for different scenarios showing how your GKI and ketones correlate with HbA1c and blood glucose. Really low GKI values (i.e. 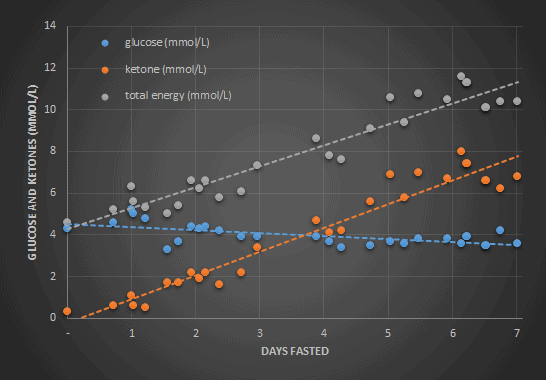 very high ketones and very low glucose) are typically seen in extended fasting when glucose levels to drop and ketones from body fat increase in a low insulin state. The chart below shows my blood ketone and glucose levels during a seven day fast. Amazingly, as my blood glucose levels dropped below 4.0 mmol/L my ketones drifted up to 8 mmol/L. During more recent, however, I haven’t been able to achieve such high ketone levels. While we can get these high ketone levels during fasting, we typically don’t see them in the fed state. To give you an idea of what to expect, the chart below shows GKI values over time during fasting for RD Dikeman (from Type 1 Grit), Jimmy Moore, Simon Saunders (Keto Island) and myself. As a rule of thumb, you might expect to see a GKI value less than 2 after two or three days of water fasting. Being a big fan of Dr Phinney and the Art and Science books, I couldn’t help running his recommended diet through the Nutrient Optimiser. I entered all the meals in the Art and Science of Low Carb Living into Cronometer and ran it through the Nutrient Optimiser. If you’re interested, you can see the full report here and where these meals rank on the leaderboard here. If you have great blood sugars and just want to lose weight then you should focus on maximising nutrient density while reducing the energy levels in your bloodstream. There is no need to worry about “being in ketosis”. You will produce ketones if you are successfully achieving an energy deficit and burning your own body fat stores. If you are insulin resistant then you will want to limit your insulin load to a maximum of 2.9 g/kg LBM. This will restrict carbohydrates in your diet so your blood sugars stabilise. If you are trying to manage diabetes then you want to keep your insulin load under 1.8 g/kg LBM. This will restrict carbohydrates and may reduce your protein intake a little. If you require therapeutic keto then you will want to keep your insulin load less than 1.1 g/kg LBM and may need to consider limiting protein. The recommended values for protein and insulin load are shown in the table below. Can run the numbers for me? I realise all this data can be confusing if nutrition is not your hobby. 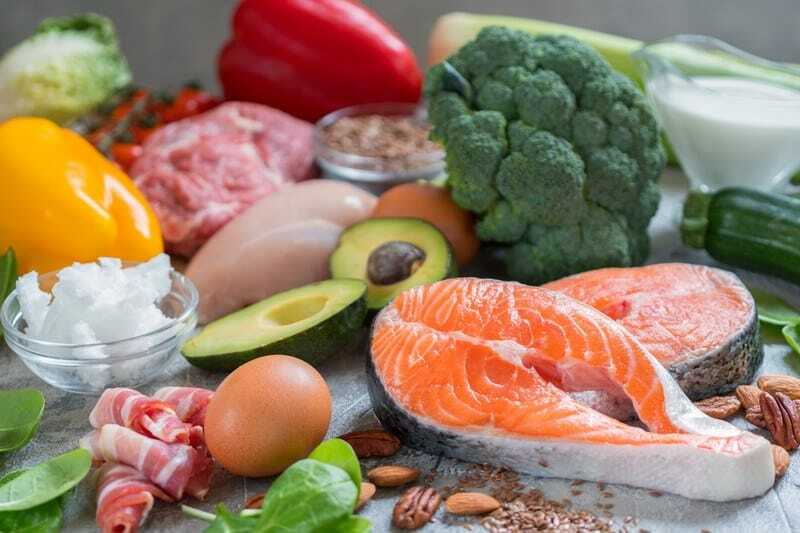 Head over to Nutrient Optmiser where we will help you identify the ideal macronutrient ranges to suit your goals, as well as a shortlist of optimal foods and meals. The table below shows how we can determine the optimal approach for you based on your metabolic health, waist to height ratio and goals. We’d love you to check it out the Nutrient Optimiser. We’d love to hear what you think and how we can refine it to suit your goals. – These two links didn’t work. thanks for the heads up. fixed the links. Valuable information all in one place! Thank you! Thanks for sharing such a brief detailed info about keto diet. Very helpful and impressive stuff.